Colorado and Washington marijuana legalization: Why aren’t liberals as excited about state challenges to federal gun laws as they are about challenges to federal drug laws? Are liberals hypocrites for supporting state challenges to federal marijuana laws but scorning state challenges to federal gun laws? 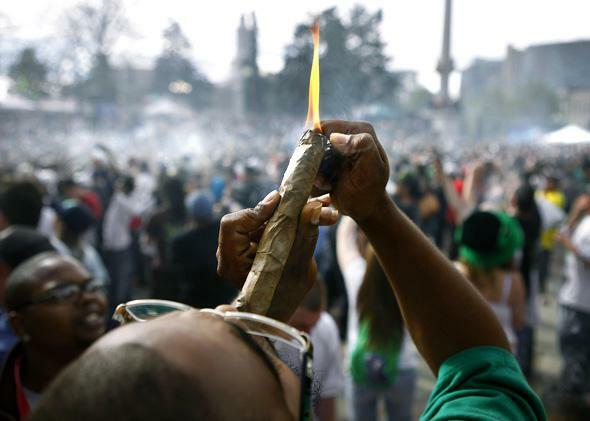 A person identifying himself as Jermagisty Tha King of Denver lights up a 28-gram blunt in Denver, Colo., where state law now allows recreational marijuana. Washington and Colorado are getting lots of love on the left for legalizing recreational marijuana use. The states are especially looking like winners now that the Obama administration has announced that as long as they set up a “tightly regulated market” for pot sales, it won’t send DEA agents and prosecutors after the newly emboldened sellers and growers who are setting up shop. Seen another way, Washington and Colorado opened the door to the federal government to loosen its own strict bans on marijuana use—and the Obama administration just walked through it. At the same time, liberals have nothing good to say about a rash of state bills that aim to defang federal enforcement of gun laws. The latest proposal, in Missouri, was vetoed by Democratic Gov. Jay Nixon but is scheduled for a second vote to override him later this month. Missouri’s bill has rightly gotten tagged as wacko for going so far as to make it a crime for a federal agent to enforce a federal gun law—for example, by conducting a background check or inspecting a gun seller’s license. The idea of arresting ATF officers is crazy enough that in Wyoming, a state that actually has such a law on the books, no such arrests have reportedly been made. That’s not really a surprise: These state efforts to nullify federal gun laws are better understood as a form of protest against federal power in general and federal laws about guns in particular. They’ve got little to no chance of holding up in court. In the land of reality, as opposed to rhetoric, they’re a lot less meaningful in terms of shifting the balance of federal and state power than marijuana legalization. The most obvious reason that the pot laws are more effective as a curb on federal power is their indirect approach. Washington state and Colorado aren’t directly challenging the bans on marijuana enacted by Congress. And they’re sure not threatening to arrest any federal agent for enforcing those bans. Instead, the states simply boxed the feds in. The Justice Department can let the marijuana storefronts open, as Washington and Colorado voters have asked for, or shut it all down in the name of federal power. DOJ already had to make this kind of call, on a smaller scale, when states like California legalized medical marijuana. The Justice Department said in 2011 that it wasn’t an “efficient use of federal resources to focus enforcement on individuals with serious illnesses,” as in, medical marijuana users. But at that point, DOJ also warned that “large-scale” marijuana growers and sellers should not imagine themselves shielded in any way. The big shift in the new memo to the country’s U.S. Attorneys, issued by Deputy Attorney General James Cole in August, is its statement that if a state has strong regulations in place, and the marijuana business is complying with them, this “may allay the threat that an operation’s size poses to federal enforcement interests.” And so, “in exercising prosecutorial discretion, prosecutors should not consider the size or commercial nature of a marijuana operation alone as a proxy for assessing whether marijuana trafficking implicates the Department’s enforcement priorities.” In other words, bigger no longer means scarier, because bigger no longer means giant illegal drug cartel. It could someday mean a clean-cut chain, even the Starbucks of Pot. That’s why marijuana advocates are largely cheering DOJ’s new stance, even though there’s an argument it’s not really a big deal, since it includes lots of muscle-flexing language about how the feds retain the right to go after any pot grower or seller or user if they choose. I’ll go with the cheering section here: For federal law enforcement to walk by a storefront with a marijuana display in the window sounds like Amsterdam to me. The pro-pot laws in Washington and Colorado don’t have to directly challenge federal law to change it forever. The gun nullification laws, on the other hand, are all about a frontal assault. They’re the brain child of Gary Marbut, maker of a rifle called the Montana Buckaroo, who “dreams of taking down the federal regulatory state,” as Jess Bravin of the Wall Street Journal wrote two years ago. Marbut is a Tenth Amendment guy, which means he thinks the part of the Constitution that reserves some unspecified powers to the states trumps the other parts of the document (like the Commerce Clause) that give Congress lots of law-making power. Marbut’s proposed law, first passed in his home state of Montana, was called the Firearms Freedom Act. According to firearmsfreedomact.com, nine states have enacted some version of Marbut’s law, and 26 others have introduced bills to do so. Most of the time, however, the Firearms Freedom Act looks a lot more limited and less nutty than the bills in Wyoming and Missouri (and, if I’m reading right, Kansas). The majority of these state laws don’t threaten federal agents with arrest. Instead, they state that Congress can’t regulate any guns that are made and held within the state, because these firearms don’t count as interstate commerce (which is what the Constitution’s Commerce Clause says that Congress can regulate). Libertarian groups like the Cato Institute have embraced this logic, and argued in favor of Marbut’s position in a lawsuit over Montana’s Firearms Freedom Act. In August, however, they lost in the U.S. Court of Appeals for the 9th Circuit. Legally speaking, this is an easy case: Congress can regulate activities that “in the aggregate, substantially affect interstate commerce,” as the court put it. That’s true of the possession of homemade guns like the Buckaroo because “even if Marbut never sells the Buckaroo outside of Montana, Congress could rationally conclude that unlicensed firearms would make their way into the interstate market.” Case closed. The only court that can say otherwise is the Supreme Court. Marbut is planning to ask the justices. Odds are they’ll just ignore him. In the end, state laws legalizing marijuana could topple a huge federal beast—the war on drugs—while the gun nullification bills are showy but impotent. Correction, Sept. 4, 2013: In the accompanying photograph, a marijuana blunt was incorrectly described as being 28 ounces.